Address the special needs of the least developed countries. 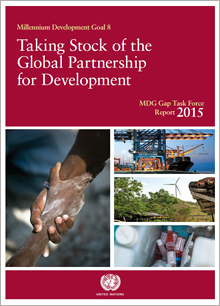 Includes more generous ODA for countries committed to poverty reduction. Indicator 8.1: ODA from DAC countries rose from 0.22% of their GNI in 2000 to 0.29 % in 2014. DAC ODA to LDCs rose from 0.06 % of donor GNI in 2000 to 0.10 % in 2013. Indicator 8.2: Aid to basic social services in 2013 was equivalent to 14.5 % of bilateral sector allocable aid. Indicator 8.3: In 2014, 83 % of bilateral DAC aid was untied, up from 80.4% in 2000. Indicator 8.4: ODA flows to LLDCs in 2013 were 3.62 % of their GNI, down from 6.4% in 2000. Indicator 8.5: ODA flows to SIDS rose from 1.7% of their GNI in 2000 to 3 % in 2013. Indicator 8.1: UN Target for ODA and UN Target for ODA to LDCs set numerical targets. Indicator 8.3: The Paris Declaration on Aid Effectiveness includes an indicator for untying aid. More information about the Millennium Declaration.